Maruku Arts Dot Painting Workshop provides a fun introduction to Western Indigenous Art. Join Indigenous artists and learn about the different symbols used to create beutiful works of art depicting Creation Time (Tjukurpa) stories. Create your own artwork to take home as a memento of your experience. NB: Maruku Anangu employees are traditional aboriginal people with strong cultural obligations. In the event of ceremonial duties, unforeseen circumstances or weather conditions workshops may be altered or cancelled. On arrival we will be greeted by our Anangu host. The Anangu are the traditional owners of Cave Hill, which is the site of the Seven Sisters Tjukurpa (creation time) , and are repsonsible for maintaining only that chapter of the Songline lying within the boundaries of their traditional homeland - a story that has been maintained since the beginning of time. The highlight of the tour is the magnificent cave paintings - possibly the most significant art site in Central Australia. 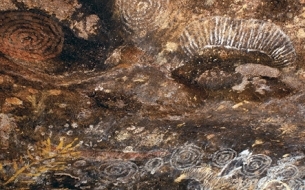 The drama of the Seven Sisters creation story is graphically illustrated on the ceiling of the cave. Climb to the top of Cave Hill to admire a 360-degree panoramic of the surrounding countryside. SEIT Patji - "A True Aboriginal Experience"
Join the Traditional Uluru Family in their homelands and experience their culture and family history. Hear from the Traditional owners themselves on how Paddy Uluru fought for Aboriginal lands rights to where Uluru is today. See the waterholes his sons drank from on their first sighting of the rock. Try spear throwing and witness modern hunting and fire stick farming. Your guide Sammy Wilson's traditional name is Tjama Uluru. He is the son of Yankunytjatjara woman named Nellie Kalkulya Wilson Uluru. A community chairman and government advisor, Sammy is also the first born grandson of Paddy Uluru the senior traditional custodian of Uluru throughout the fight for land rights in the 1970's. Sammy has worked as a tour guide for more than 14 years in Uluru and wants to share knowledge of his land so you enjoy more than just the tourist side of the rock. Pukulpa ngalya yanama, nganampa ngurakutu... "Welcome to our country"
Come for the rock, discover the people.